Since 1996, MWRA has provided a monthly Water Quality Update to local water suppliers, public health officials, water consumers, and other interested parties. 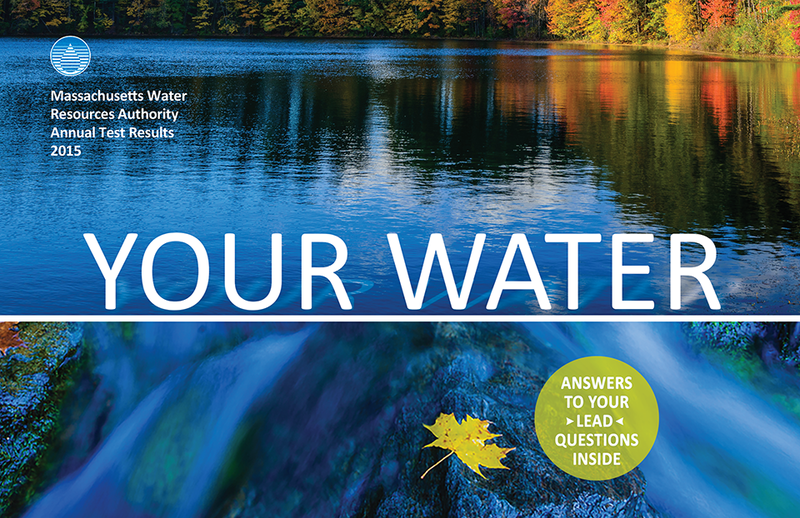 The monthly update provides a more detailed review of water quality than the annual water quality report that is mailed each June to every customer in our service area. The annual report at right provides a good overview of where the water comes from, how it is treated and tested, and what the tests show. Once youve read the annual report, you may want more detail which can be found in the monthly data. If you would like a monthly e-mail notification alerting you to when the latest Update is posted, with highlights and a link to the web version, please call (617) 242-5323 or email Joshua Das, Project Manager, Public Health. The following is a brief description of what is included in the monthly Update. Tests are conducted on water sampled at the source reservoirs (source water) and also on water after treatment and sampled from MWRA or community lines (treated water). Testing frequencies vary by parameter. Microbial: Bacteria are monitored in both source and treated water to provide an indication of overall bacteriological activity. Daily results are shown for Quabbin and Wachusett Reservoirs. Total coliform results are listed by community as well. Algal levels in the Quabbin and Wachusett Reservoirs are listed. These levels are monitored by the Massachusetts Department of Conservation and Recreation (DCR) and MWRA, and along with taste and odor complaints, are used to make decisions on source water treatment for algae control. Turbidity: Turbidity is a measure of suspended and colloidal particles including clay, silt, organic and inorganic matter, algae, and microorganisms. It is one measure of overall water quality. Turbidity is measured continually at both Quabbin and Wachusett Reservoirs. Corrosiveness: In order to minimize the leaching of lead and copper in home plumbing systems, the pH, or corrosivity, is monitored and adjusted. Water provided by MWRA is basically lead free when it leaves the reservoirs but household plumbing can contain lead that can enter tap water through corrosion and leaching. MWRA treats the water at the John J. Carroll Treatment Plant with sodium carbonate (soda ash) and CO2 (carbon dioxide) to increase the pH and buffering capacity of the water. This has considerably reduced lead levels found when you first use your tap. Daily pH and alkalinity results are available in the Update. For more on Corrosivity/Lead go to Lead in Drinking Water or Disinfectant Changes and pH Levels. Disinfectantion Residual: MWRA treats water with ozone instead of chlorine for primary disinfection. Community disinfection residual levels are listed within the Update. Disinfectant By-Products: Total trihalomethanes (TTHMs) and Haloacetic Acids (HAAs) are by-products of disinfection treatment with chlorine. Chlorination levels, the presence of organic precursors, pH levels, the contact time of water with chlorine used for disinfection, and temperature all affect TTHM and HAA levels. Running annual averages and high, low, 90th, and 10th percentiles are available within the Update. Mineral Analysis: Further results on minerals and other water quality parameters are available for untreated source water and fully-treated finished water. These results reflect a snapshot in time and may not represent typical conditions.